For a light and very tasty dish. Soften the sliced onion in the olive oil. Add the courgette and aubergine cut into cubes and the chopped tomatoes for about twenty minutes. Half way through cooking, add the chopped garlic. 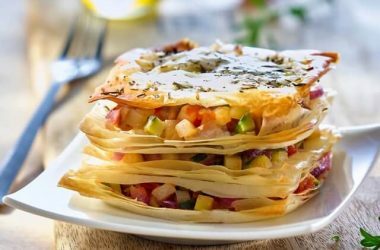 During this time, lightly brush the sheets of filo pastry with butter and then cut into 54 squares measuring approximately 10×10 cm (half a sheet approximately). Group them into threes to make 18 packs. To make your first mille-feuille, place 1 pack of 3 squares on your tray and then cover with a first layer of the mixture, add a second pack of squares, and then cover again with the mixture. Repeat this one more time. 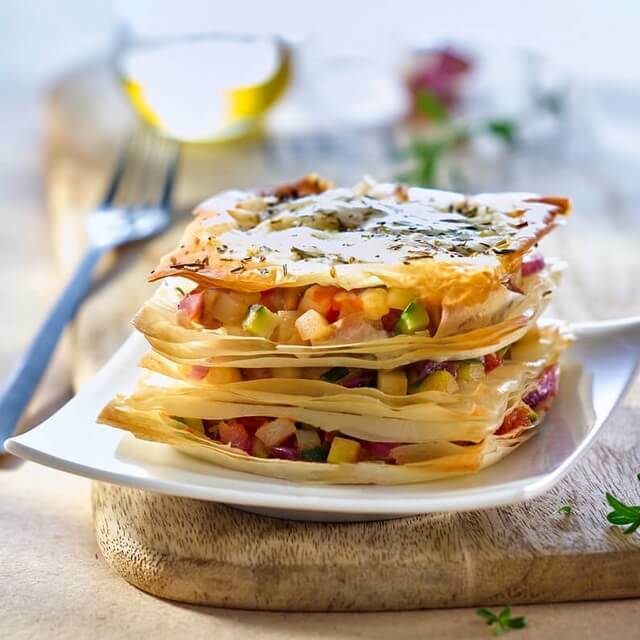 Cover the last layer of filo pastry with mozzarella and rosemary. Repeat the same procedure for the other 5 mille-feuilles. Bake for about ten or twelve minutes. Previous recipe Design your own sweets!